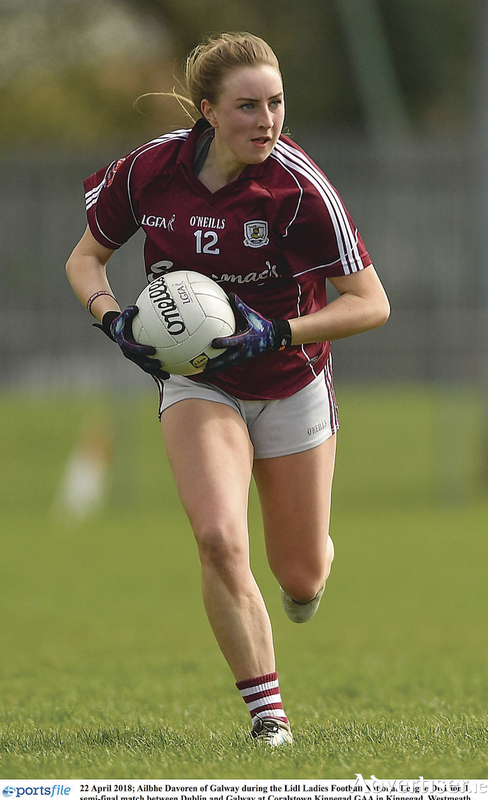 Ailbhe Davoren - a big loss to Galway for the remainder of the season. The Galway Ladies are in action this Saturday when they are up against Dublin in the eagerly anticipated All-Ireland semi-final in Hyde Park (4.30pm ). Dublin, the current reigning league and All-Ireland champions, are hot favourites to advance to another final this weekend, while their expected opponents who contest the other semi-final, also on in Hyde Park on Saturday (2.45pm ), are Cork and Donegal. After a solid and positive season, the Galway camp has been rocked by the recent cruciate ligament injury to Ailbhe Davoren from Moycullen. She had been in tremendous form all season and will be a huge loss this weekend. Her ball winning ability, mobility and intelligent use of possession ensured she was one of the first names on any Galway senior team sheet. Davoren, who is a student at UL, suffered the injury late in the quarter-final victory over Mayo, and it is a huge disappointment to see her football season end on such a low note. Her clubmate and county teammate Áine McDonagh, who is also struggling with a shoulder injury, had to sit out the quarter-final, and is under pressure to be back in time this weekend. Team manager Stephen Glennon is extremely disappointed to lose Davoren. "Ailbhe is a super Gaelic footballer and a really positive young woman," he says. "She has been in superb form all year and had scored 3-09 from play in both the league and championship and she will be a big loss to us on the field this Saturday. "Everyone in the squad was really upset to see her get badly injured the last day and hopefully she will be able to make a full recovery for her club, college and county for 2019." While acknowledging how good Dublin are, Glennon is hopeful his charges can really have a go at them in Hyde Park. "Obviously with Ailbhe out, and Áine McDonagh also under pressure with injury, there will be an opportunity for other players to come in and try to make a big contribution on the field of play. "Thankfully we have a strong panel, and with injuries part of sport it is vital that we have to compete at the top level. Players such as Lisa Gannon, Noelle Connolly, Leann Walsh and Shauna Molloy - to name just a few - have all been pushing for starting spots and doing very well when they have come on, and we know that it will take full panel effort if we are to beat Dublin. "The mood in our camp is very positive about the weekend and the girls have worked tremendously hard over the past few weeks and months to try to be in the best shape they can for these challenges. We will be putting our best foot forward and taking the fight to Dublin. We expect to be very competitive and see where that takes us." Dublin had a facile 3-19 to 1-07 win over Kerry in their quarter-final with their much vaunted full-forward line of Sineád Aherne (1-7, 3fs ), Niamh McEvoy (1-2 ) and Noelle Healy (0-2 ) doing most of the damage up front. It will be a big task for Galway goalkeeper Lisa Murphy and corner backs Sinead Burke and Fabienne Cooney, who will have to be on red alert to keep those Dublin forwards in check. Up front Galway will look to team captain and star forward Treacy Leonard to lead the way in the scoring stakes, with support from Olivia Divilly, Leanne Coen, Sarah Conneally and Roisín Leonard. Others who will need to turn in big performances if Galway are to advance to the final include Nicola and Louise Ward, Charlotte Cooney and former All-Star Emer Flaherty.